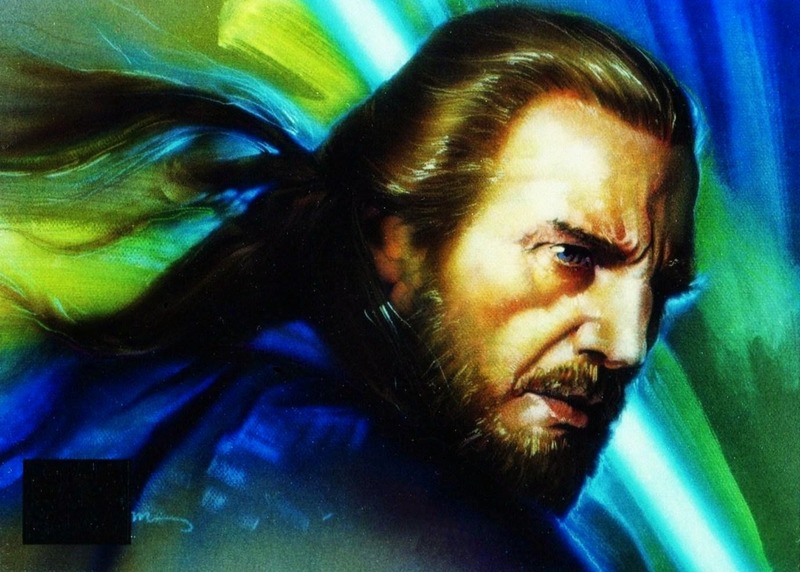 Throwback Thursday is something that, while I have no idea where it came from, is fun, so I take part occasionally. 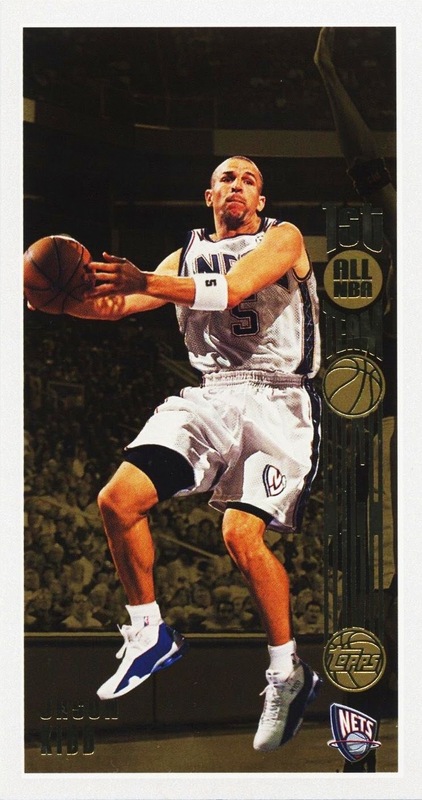 I have decided to post a (sometimes) random vintage card on Throwback Thursday. For the NBA, the cutoff will be 1985-86 or older. For non-sports, the cutoff will be 1984 or older. That's the year I was born so I am setting the breakline at my birthday...older than me is vintage, younger than me is not. 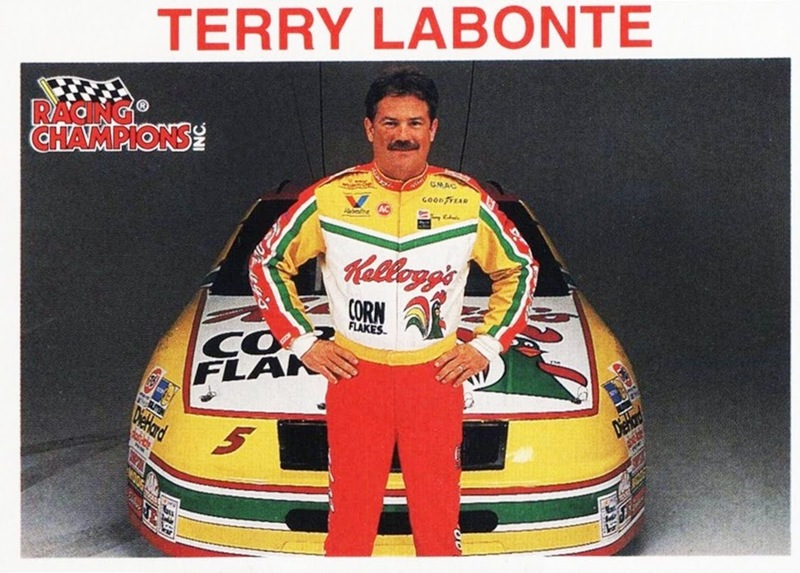 NASCAR didn't get cards in the vintage era so they will not be included. I have some vintage hockey, baseball and football so they likely WILL be included. I will try and show one vintage card every week, if I remember and if I have nothing better to post about that day. 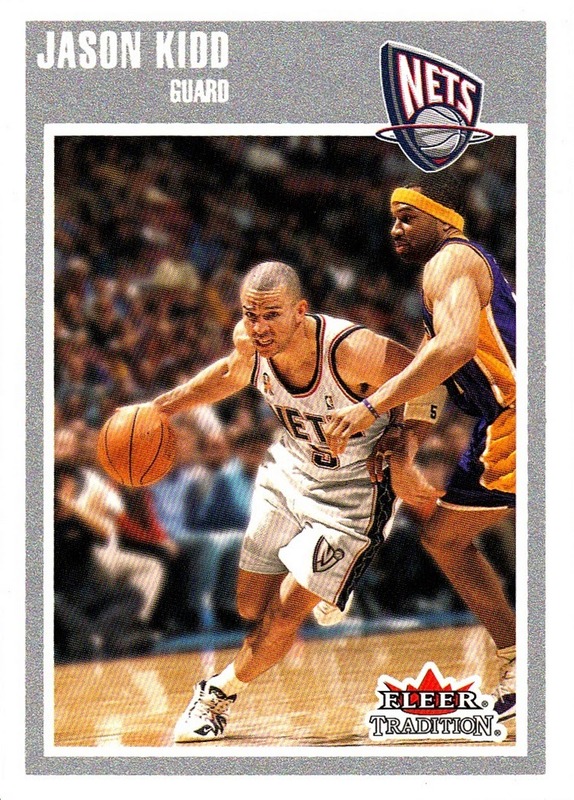 Today I begin with the first vintage card I ever purchased, I believe, back in 1996, when I discovered the NBA. A small shop in Fishkill, New York had several vintage cards in the case, and I got three of them all around the same time, but unfortunately I didn't keep records yet at the time. I THINK this one was the first, but it may be the second or third. There's no way to know. However, this is the only one I've scanned of the three possibles so we're going to go with it being the first. 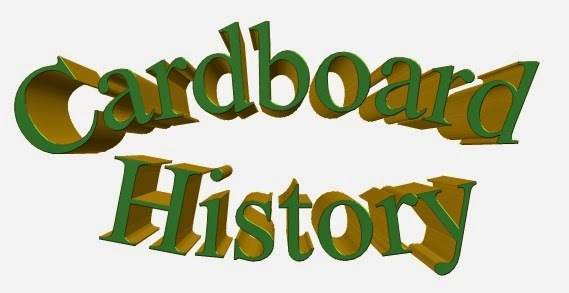 Thanks for reading, and stay tuned for next week's Throwback Thursday! Darrell Wallace Jr. 2015 Press Pass Cup Chase Melting Foil 1/1...now part of my collection! I had a small backlog of the 2015 Press Pass retail parallels that I was waiting to scan...the foil they used isn't as "foiley" as they have used in previous years, and they scan the best when the entire tray is made up of them. I had 8 cards and I figured I'd pick up another red or purple somewhere, probably via trade, as I've cleaned out my local Target and Wal-Mart of blasters. I had no idea that I would instead finish off the page with one of the 1/1 Melting Foil parallels from the hobby release! 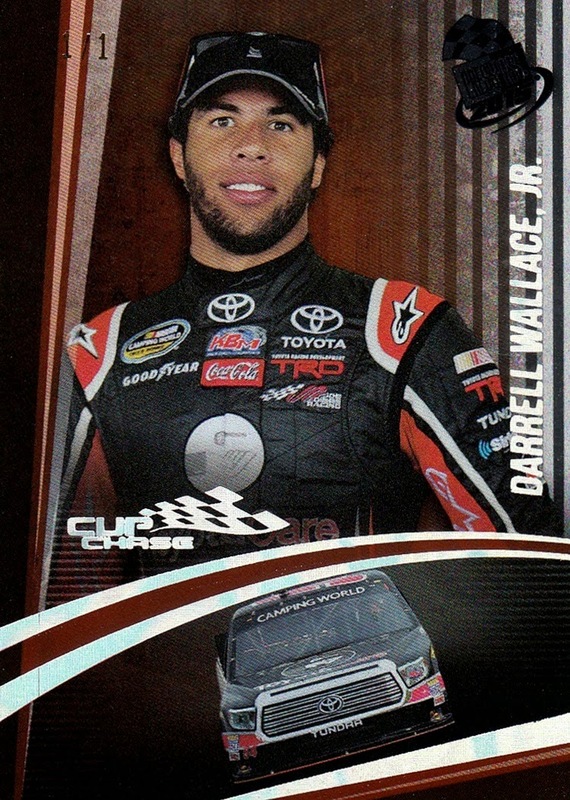 I am making the effort to get all of Darrell Wallace Jr's cards. The 1/1 of his base card showed up on Ebay and my mom went and bought it for me. Thanks Mom! 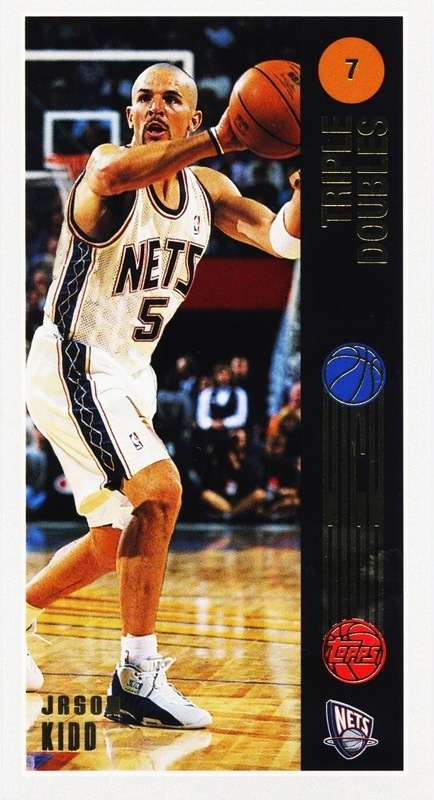 The "melting" aspect of the foil doesn't really show in the scan, so here's a photo I took that shows it a little better- especially in his name. The card is still in the toploader it arrived in in this photo. 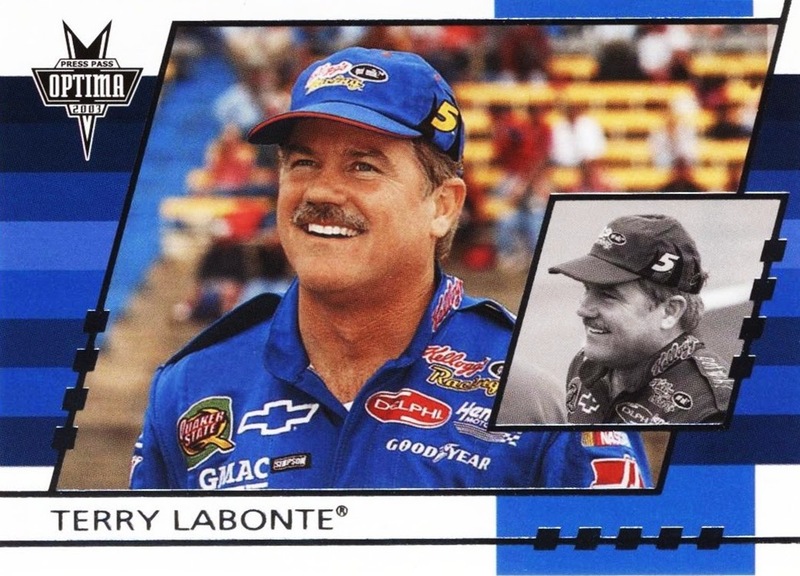 This means that I have now gotten three of my favorite NASCAR cards in my collection, which is in it's 22nd year, all in March 2015. It's been a good month! I've said many times, and in many places, that I liked the hobby better before there were autograph and relic cards. I also love to get them, and I would miss them if they stopped being produced. Does this make me a hypocrite? I believe it does. So what? 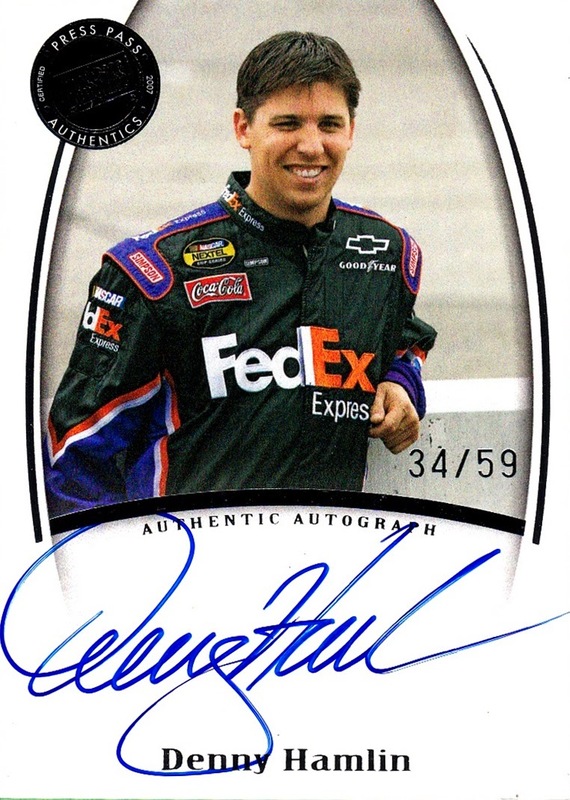 I love all cards...and I'll add them to my collection when I can, and Dave & Adam's Cardworld recently debuted a NASCAR pack in their Hit Parade series. 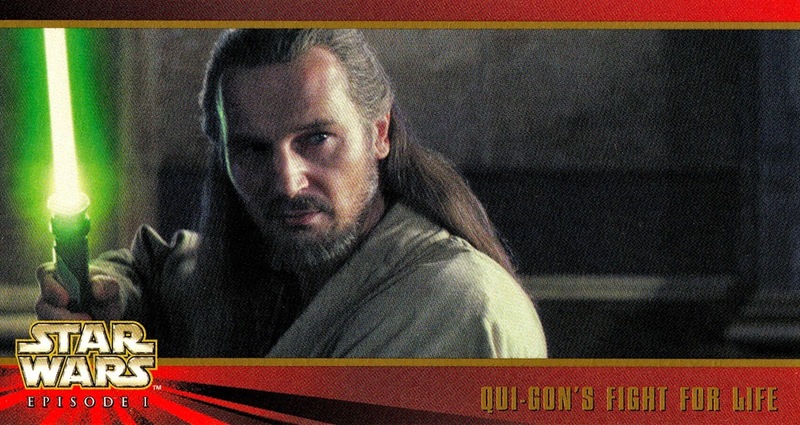 I got 4 of them, and it turned out that I ended up getting one of the nicest relics in my collection. Interestingly, I had previously pulled a parallel of the very same card, and the base version turned out to be much, much nicer. I thought about showing them in order, but I MUST start with the best one. Holy crap! That is an incredible piece, very clearly from the Coors Light Pole Award contingency. 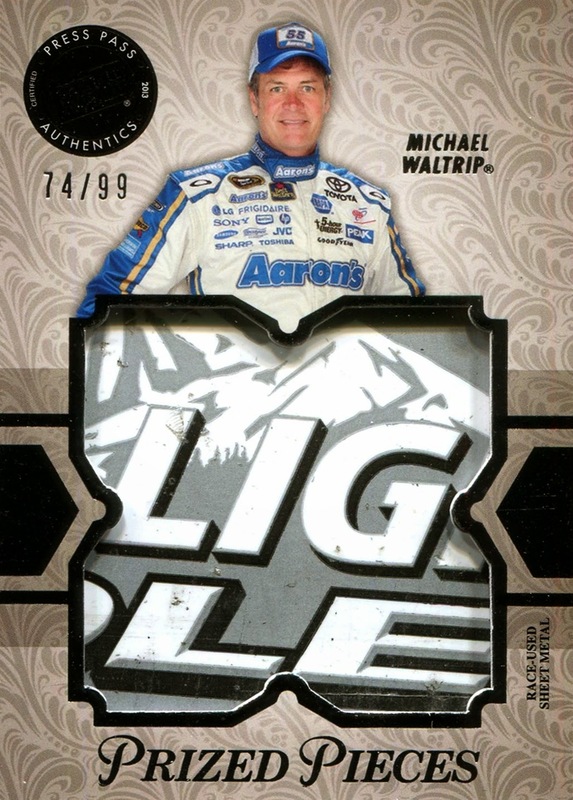 As you may recall, and could easily find by clicking the Michael Waltrip tag at the bottom of the post, I pulled the Gold parallel when I did a box of 2013 Showcase in November, and the piece on that is a single color of firesuit- off white in color. 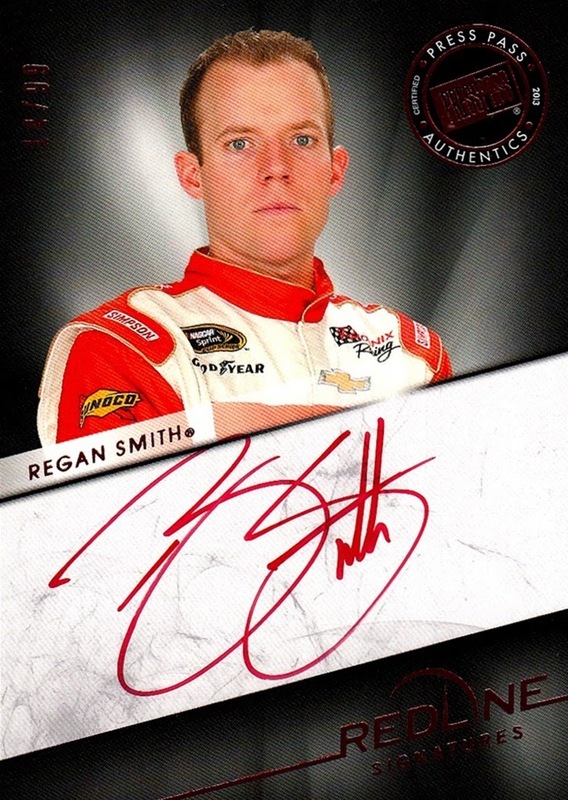 This is much, much nicer, and in this month I've gotten two of my best NASCAR cards. There is some dirt and scuffing in the sheet metal piece, (which is actually part of a decal) so I suspect it may have come off the car Michael wrecked in the 2013 Twin 125, or whatever they call it now. 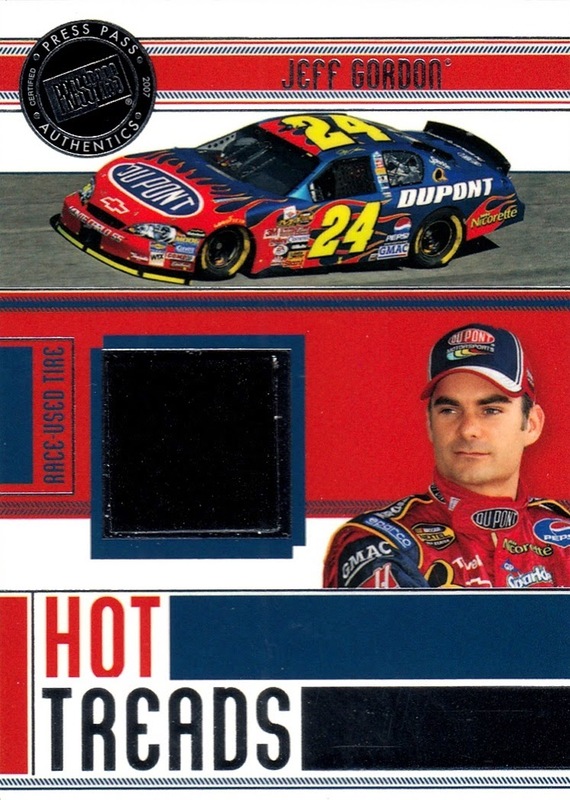 Each Hit Parade pack gives you one of these 2007 Eclipse Hot Treads Jeff Gordon cards. I'm a big fan of Jeff's, but I wish they did not give you the same card in each pack. I don't need four of them. ﻿Maybe I can trade a couple of them. Here are the autographs I got. They generally came relic/auto/relic/auto/relic/auto but I am posting the autographs first. 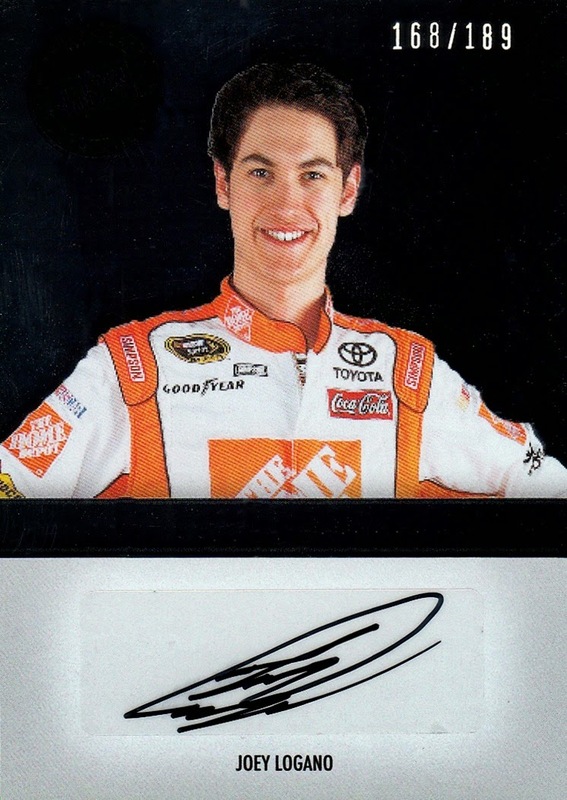 2011 Premium Signatures Joey Logano. This is a mirror foil card, which scans terribly. I won't miss these, Press Pass used the mirror foil for almost every insert since 2012. My second autograph of Joey Logano, both of which I got in 2015. 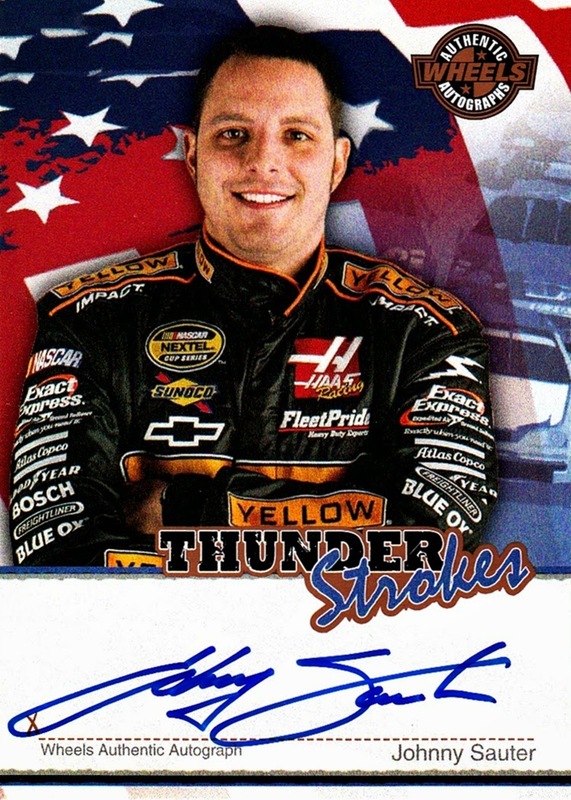 2007 American Thunder Thunder Strokes Johnny Sauter. My 3rd auto of Sauter. 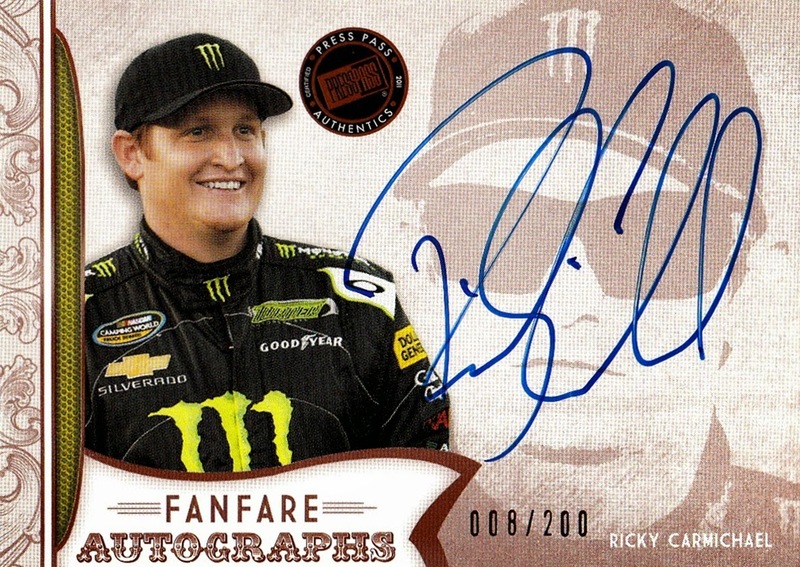 2011 Fanfare Ricky Carmichael. Nice low serial number. My second auto of Ricky. 2013 Legends Will Power. Hey, that's not a NASCAR driver! 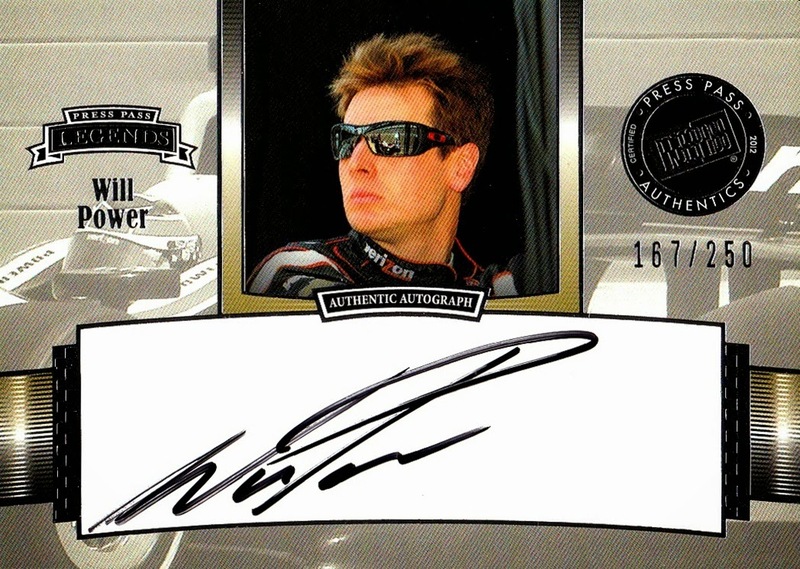 Will Power is my favorite Indy car driver, though, so I am still happy to have it. 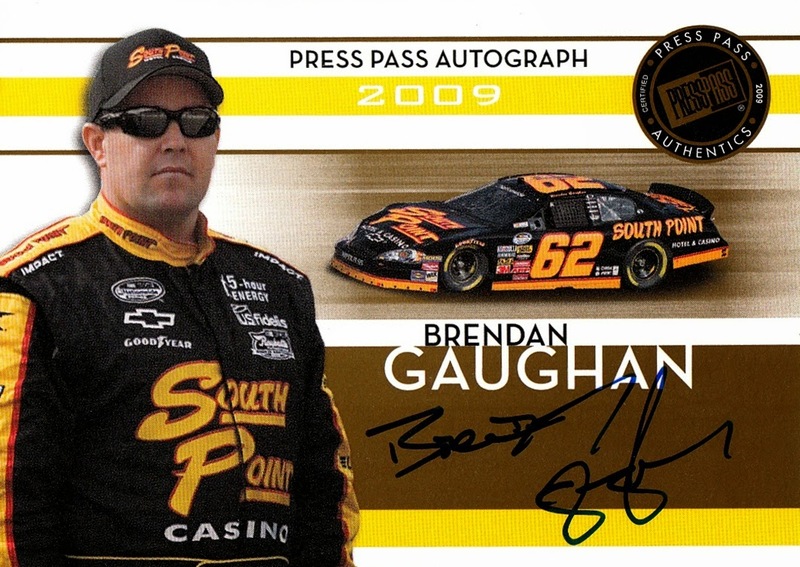 Two autographs from 2004 Wheels, I don't remember if they were exclusive to High Gear or were in both High Gear and American Thunder. 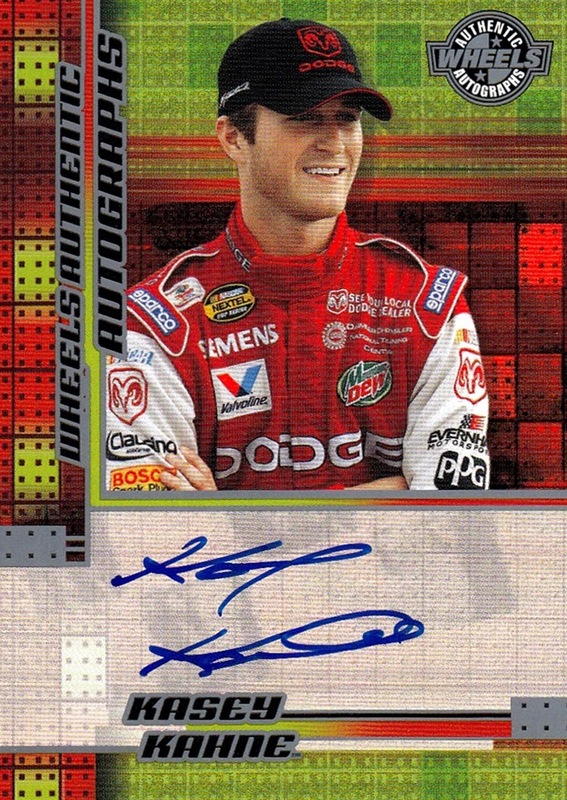 This is my first Kasey Kahne autograph, and it's from his rookie season, so that is definitely a great pull! 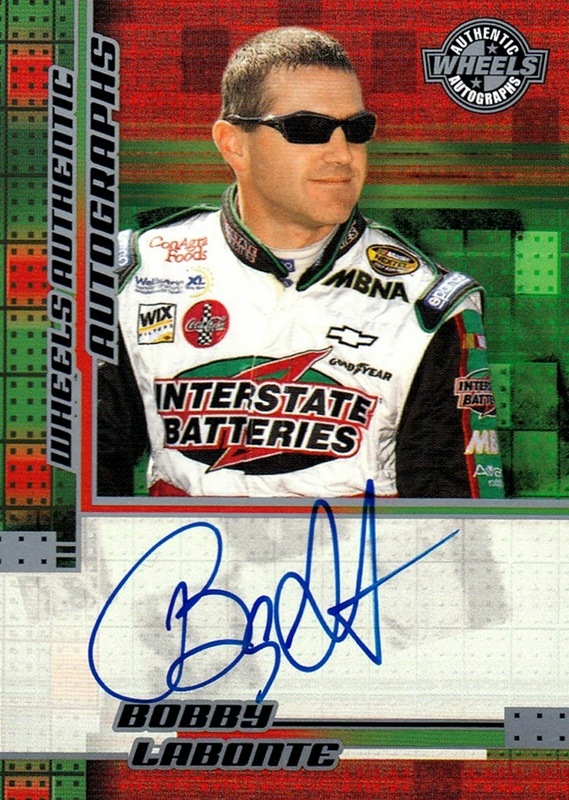 It's my second auto of Bobby Labonte. 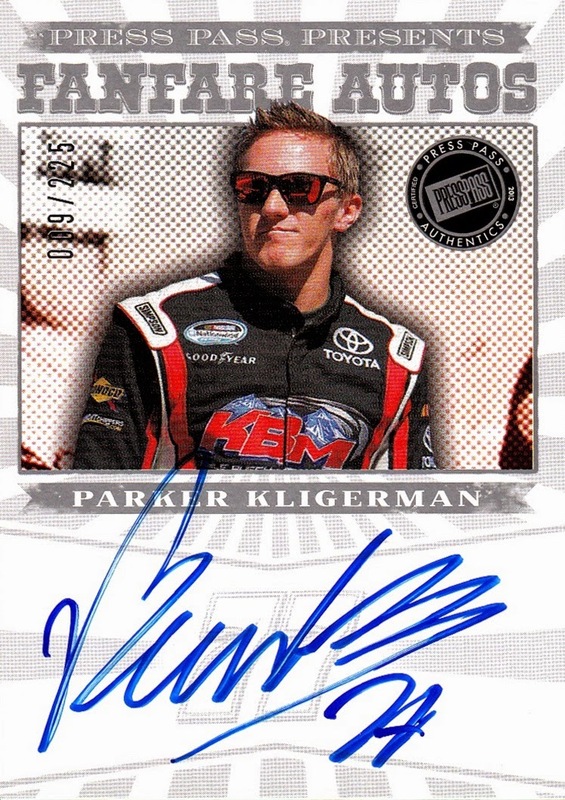 2013 FanFare Parker Kligerman. He has a nice, large signature, and I did not open a lot of 2013 Fanfare. 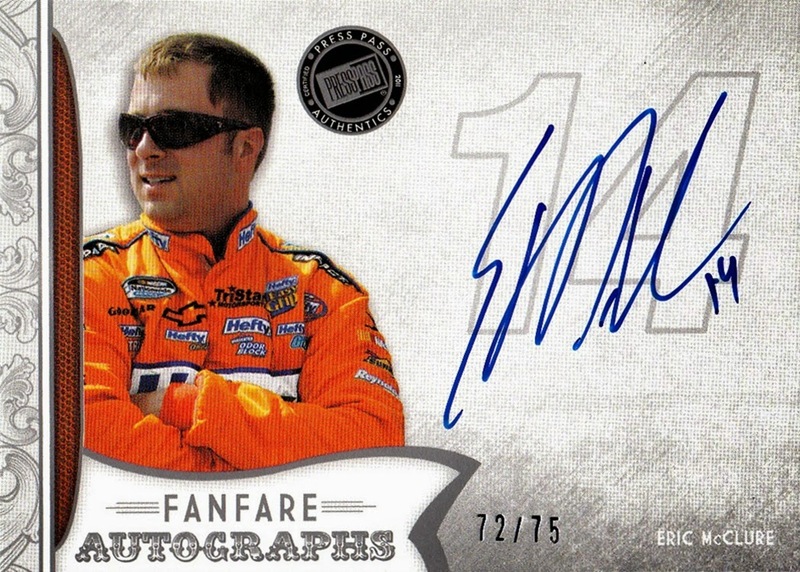 This was the last card out of the last Hit Parade pack, and it turned out to be my very first card of Eric McClure! He did not have a lot of cards issued, and off the top of my head, he only has "hits", no base cards. Eric McClure's father was one of the owners of Morgan-McClure Motorsports, which was my favorite team when I discovered the sport. Now let's look at the relics. 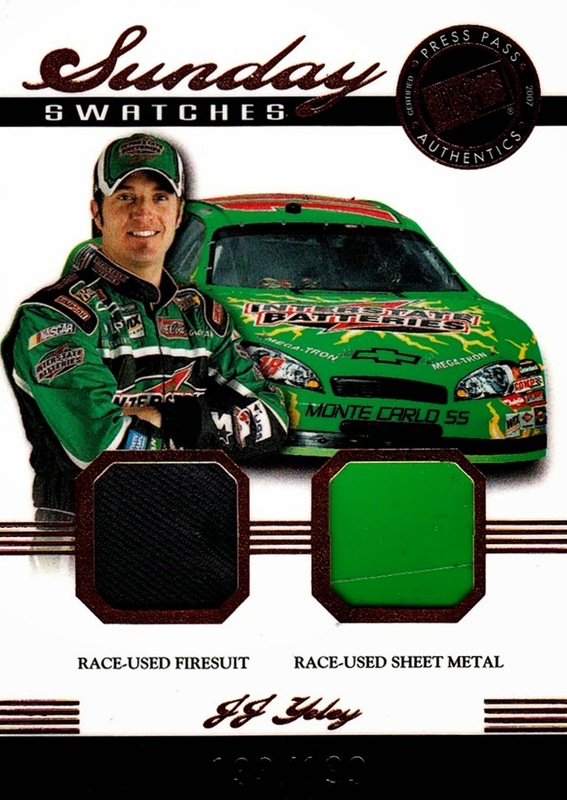 There are less relics because each of the four packs included the same Jeff Gordon card. 2006 Legends Bobby Allison sheet metal. An actual Legend in Legends!! WOW! 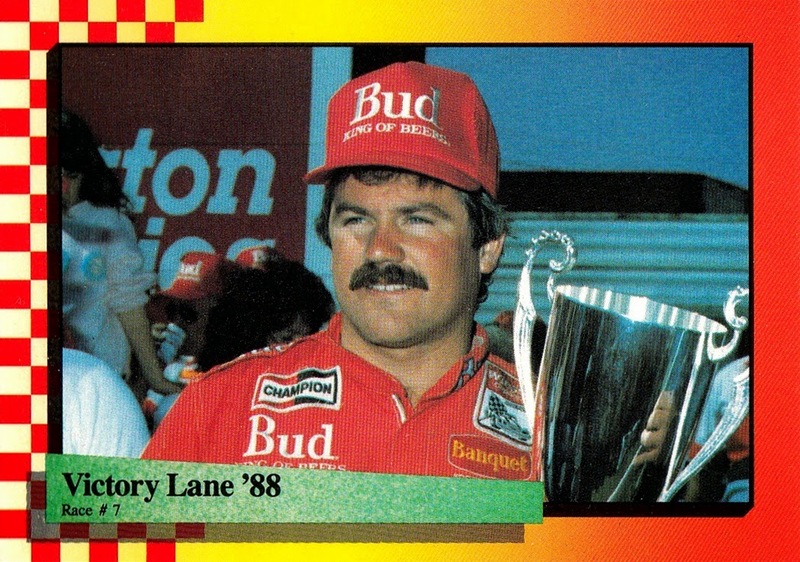 The Sheet Metal Artifacts Gold is only a two card set (Benny Parsons is the other card) giving me some hope that I may actually be able to complete a relic set. 2007 Legends JJ Yeley dual. 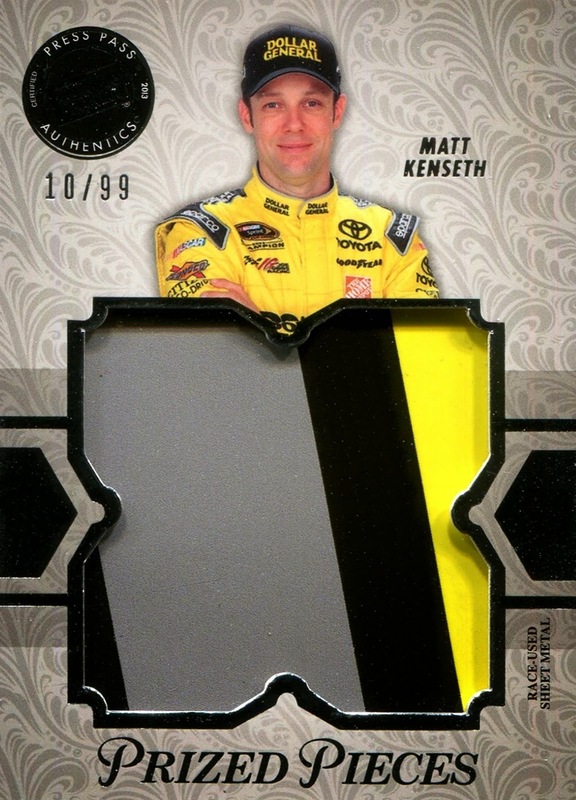 Oddly enough this is the second Yeley dual relic I've pulled. 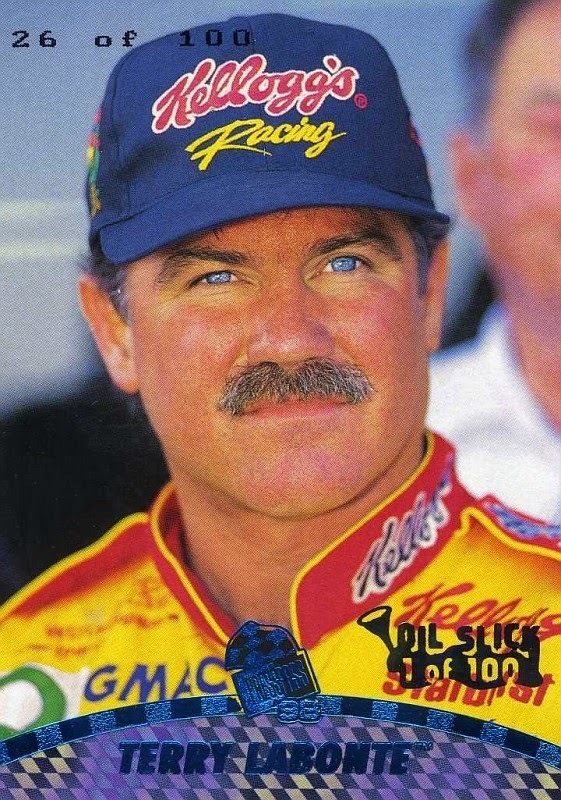 There is NO WAY Yeley should have been in Legends. 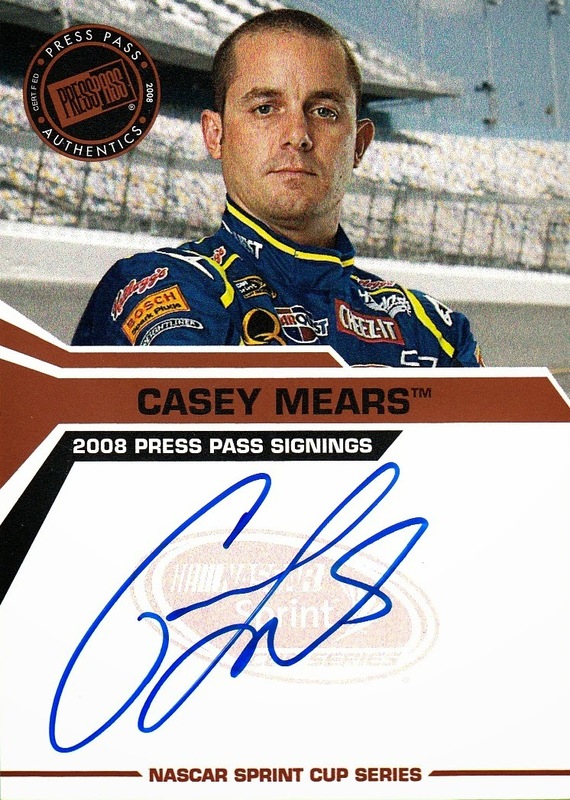 I like Yeley, but he's no more of a legend than I am. 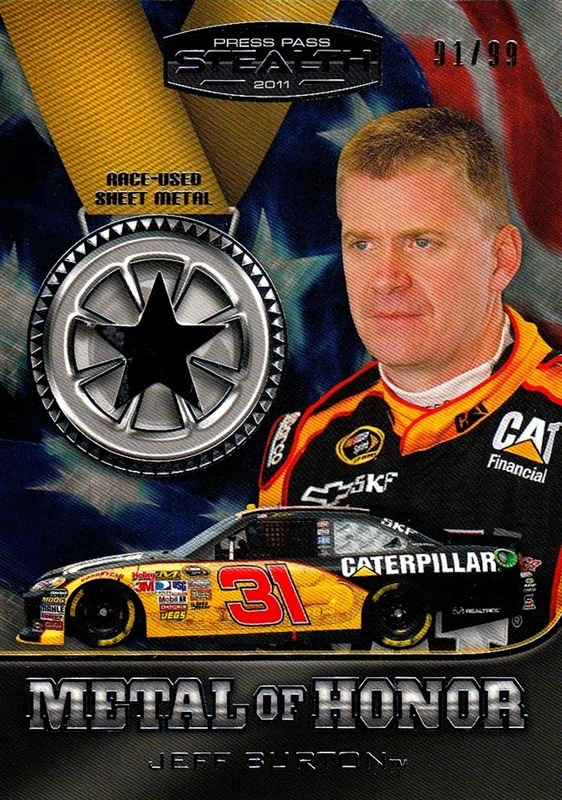 2011 Stealth Jeff Burton. That's a mighty small piece of sheet metal, The discoloration on the left side of the piece is actually some damage to the metal. Looks like it may have been taken from a wreck. 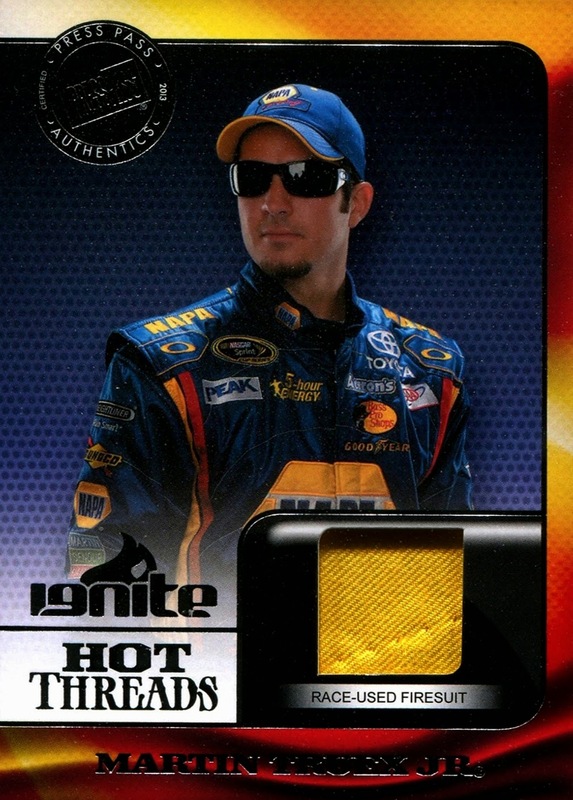 2013 Ignite Martin Truex Jr.. Yellow with some stitching. This is not from a patch, so it must be from the small yellow stripes on the sides, by the sleeves. 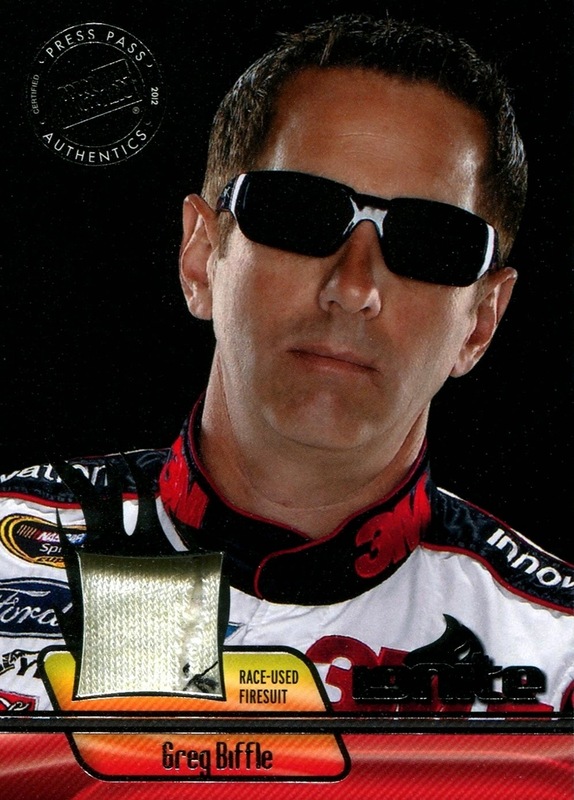 2012 Ignite Greg Biffle. 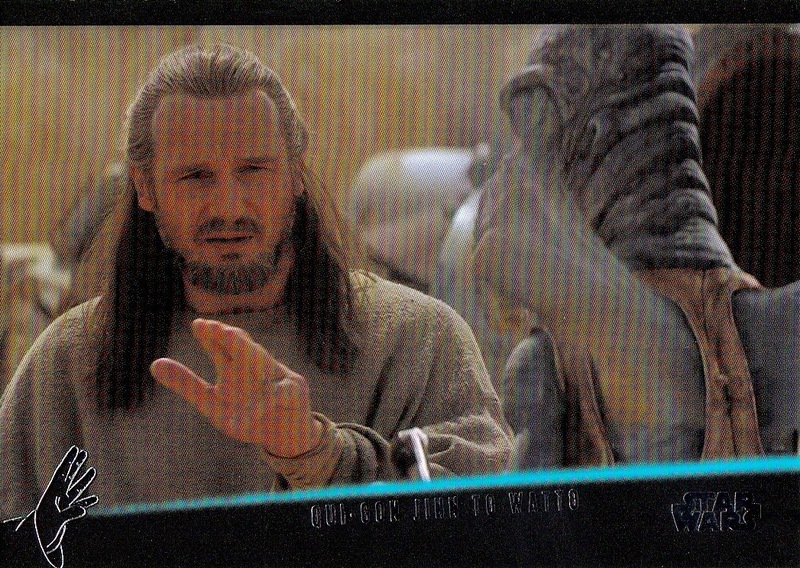 I was sure this was a duplicate, but I can't find a previous scan of it, so I guess it's not. Sorry for the poor scan. I have to use a different scanner for the deep relics and it's past it's useful life- I'm just too cheap to replace it. I am actually doing pretty well on this set, and I've considered trying to complete it. It helps that my local Target has the 2012 Ignite blasters marked down to $12 often. And that's what I got...anybody want to trade for one of those Jeff Gordon tire pieces? It's well worth the $30 per pack Dave and Adam's charges, and it seems to be a big success. I hope they do more...I'll be getting some if they do! I have so much I want to post about, but I keep getting distracted by other things, both posting things and things I'm working on that will be posted someday, that this post has been something I wanted to do since January, when I got the card, and I am just getting it written up now! I made a promise back when I began the One Hit Wonder series that NASCAR would get coverage, and I'm finally fulfilling that promise today. And what better way to start than the winner of the first ever Strictly Stock race? For those who may not know, the Strictly Stock series, after one year, became the Grand National division in 1950. 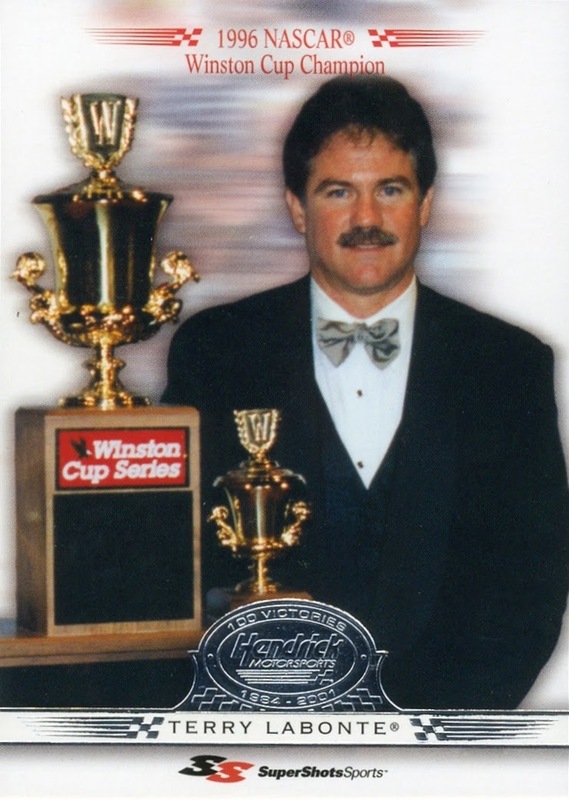 It became Winston Cup in 1971 and Nextel Cup in 2004, and since 2008 has been known as Sprint Cup. It is NASCAR's top division. 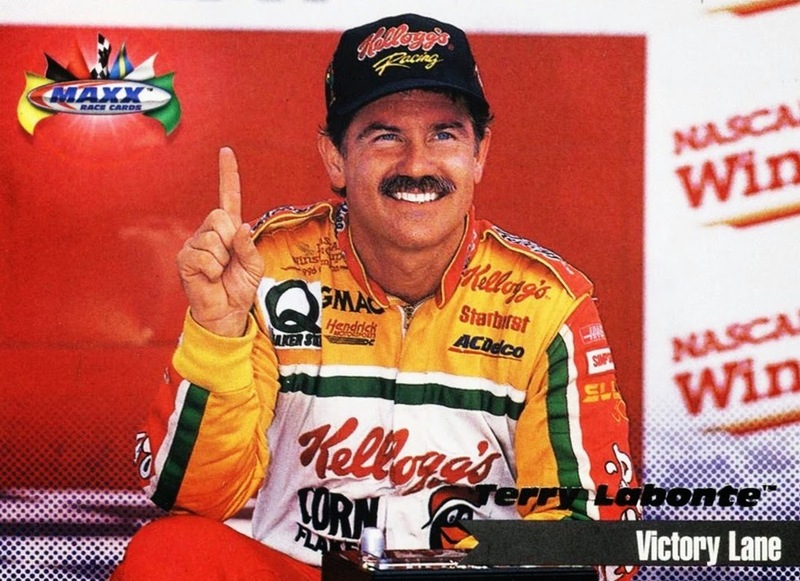 There have been more than 2000 races held in the division (actually, I think it's closer to 3000) but the winner of the first race is actually somewhat of a footnote to NASCAR history- because he won the very first race. 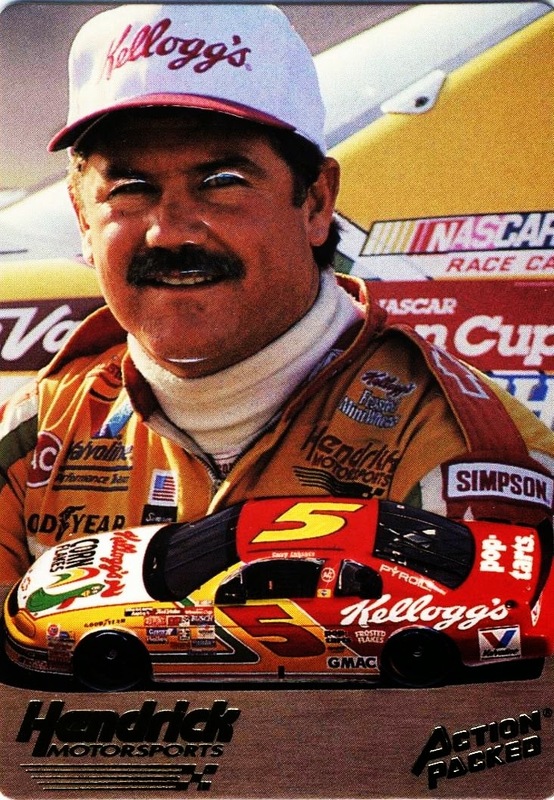 Jim Roper, of Kansas, read about the race in a newspaper, and drove his car from Kansas to Charlotte, to enter the race. He was not flagged the winner- Glenn Dunaway was- but he was DQ'd after it was found that his car had heavy duty springs installed, thus voiding the Strictly Stock agreement. He was credited with a last place finish. Roper, who was driving a Lincoln, was elevated to the victory. 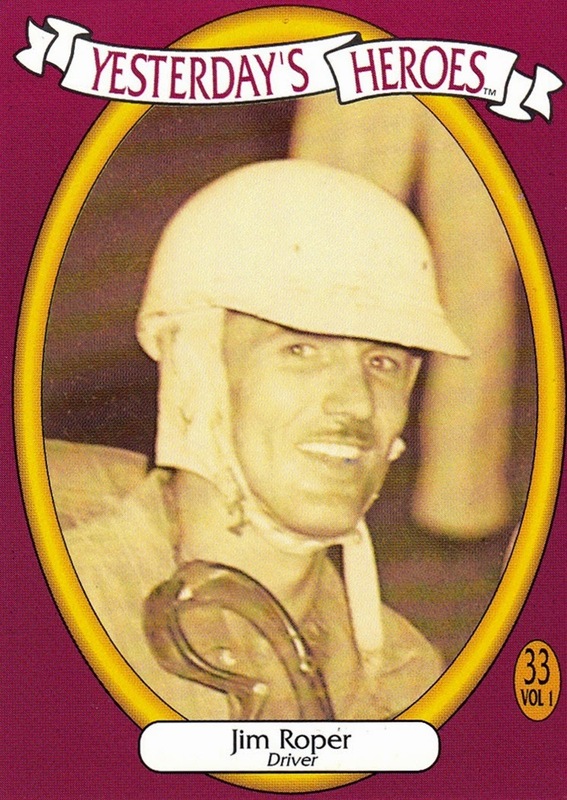 He only ran one more NASCAR race, later in 1949, and that was the end of his career. 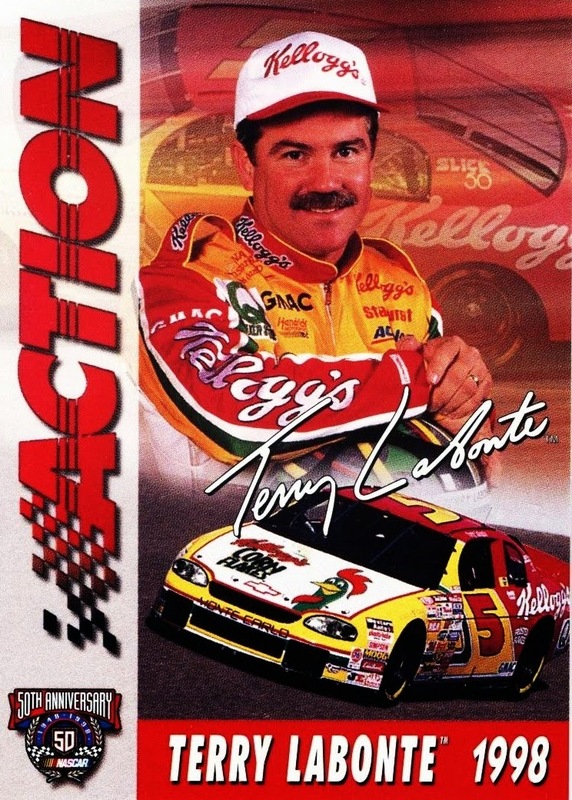 (At least as far as NASCAR is concerned, he raced in other series, but this post is about NASCAR). 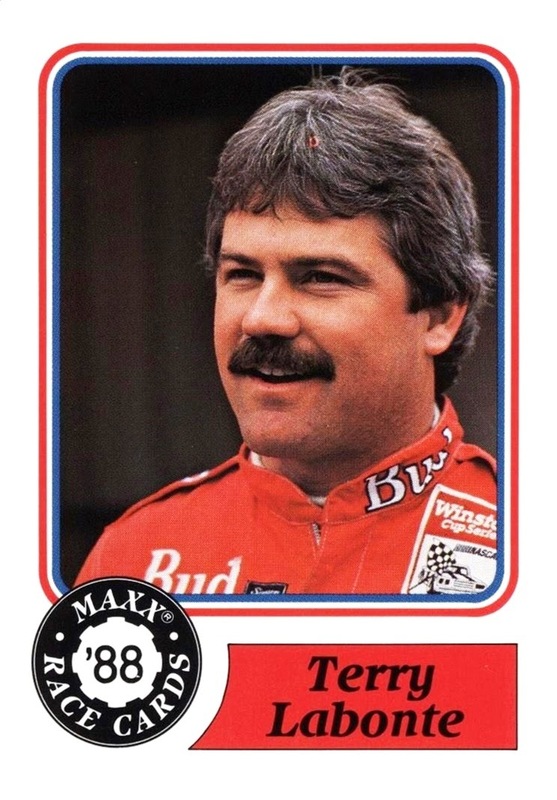 NASCAR had to wait until 1988 to get trading cards on a regular basis, and the pioneer era - roughly, pre-1959 - is not all that well covered in card form. There are, in fact, more drivers from that era without a single card that those that have them. In 1991, there was a brief surge of early days of the sport being a popular card subject, but unfortunately it didn't last very long. 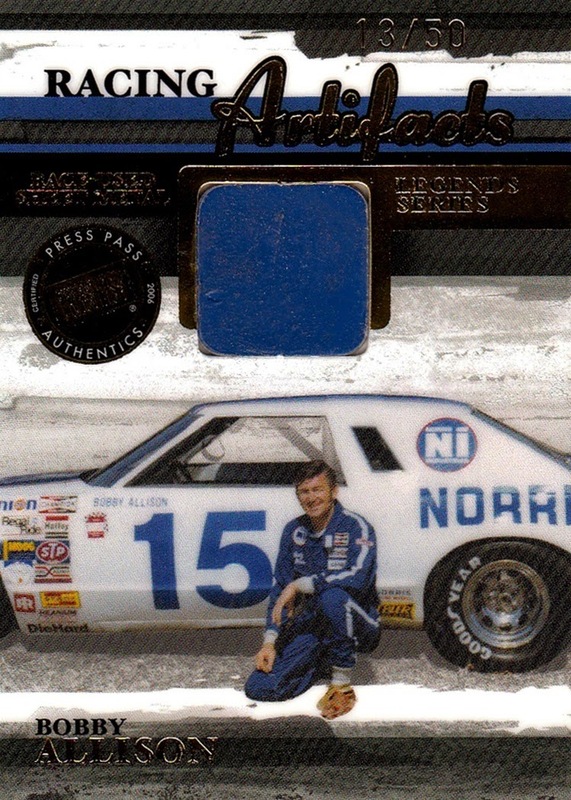 One of the sets of early drivers (mostly, it also included some later drivers) was issued by a company called Track Pack, consisting of 48 cards, which included a cover card and a checklist. It was marketed as Series 1 but it was the only series produced. All the photos are in black and white, unfortunately, even the ones that had originally been in color. It was sold as a factory set only. The set wasn't without color- although, with the color chosen, it probably would have been better off! 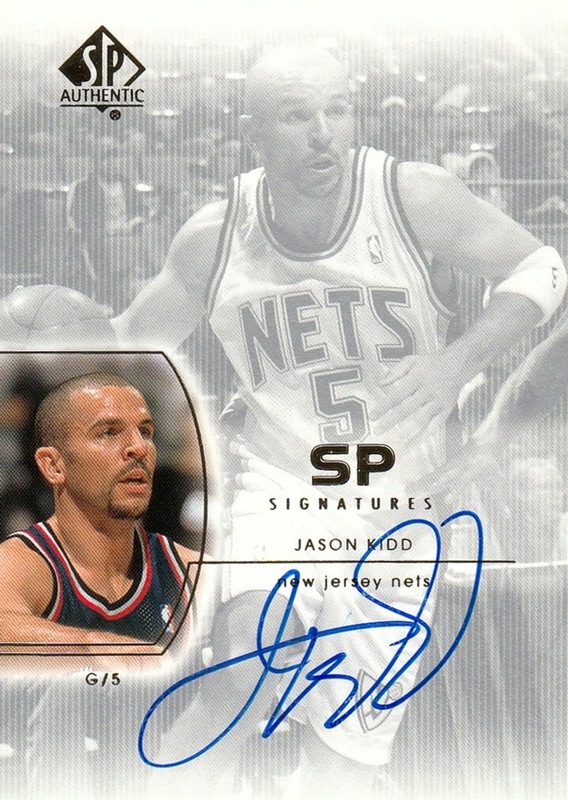 The set is unusual in that it has the card numbers on the front of the card. Cards are arranged alphabetically by last name. 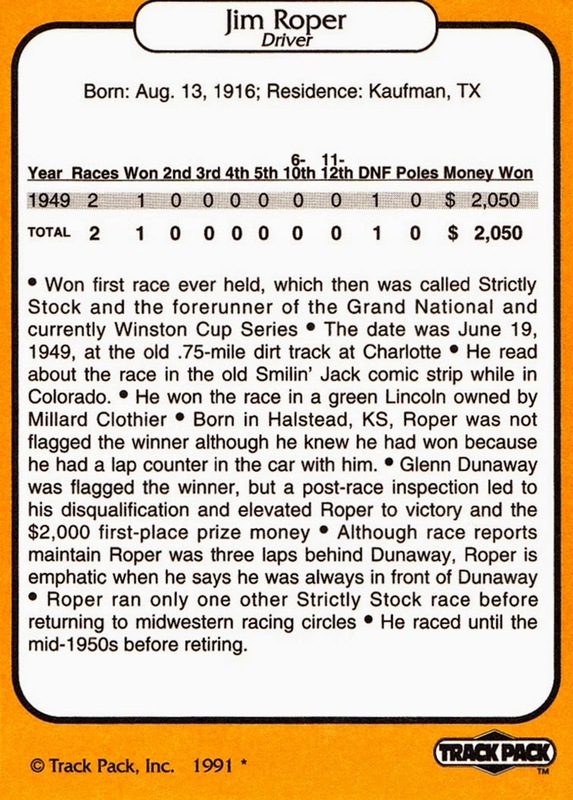 Roper is the only driver or owner in the set to be a One Hit Wonder; everyone else included has multiple cards, although some do not have many. 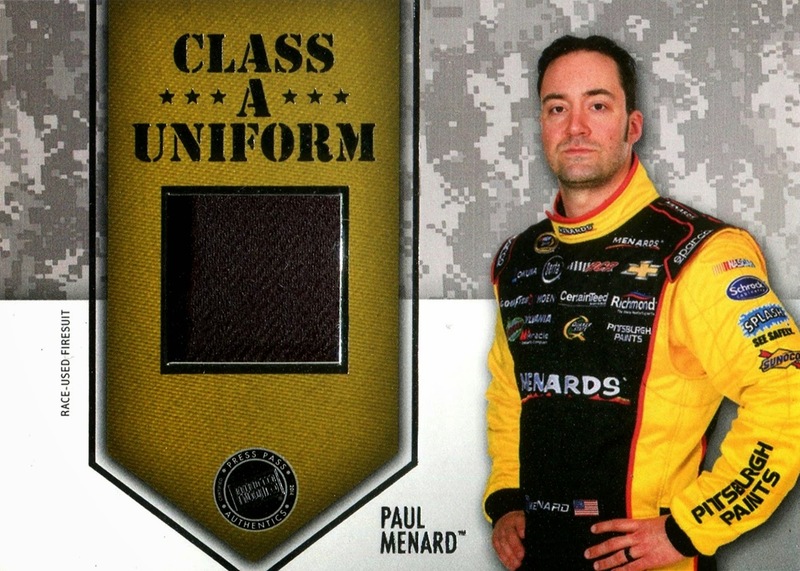 As you can see, it is not the most attractive card design, in fact, it's probably the worst card design in all of NASCAR. 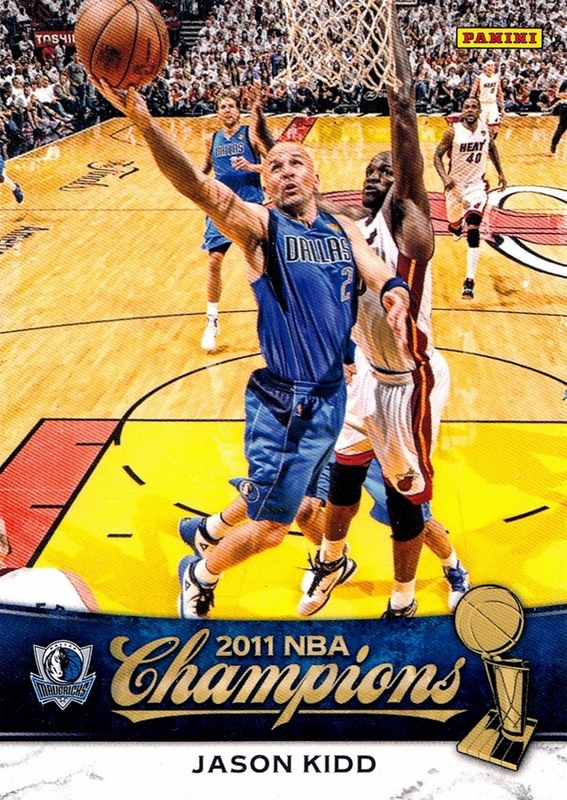 The complete 48 card set has been posted to the Trading Card Database (by me)﻿ so you can see the rest if you wish. I must say, the back of the card is excellent. 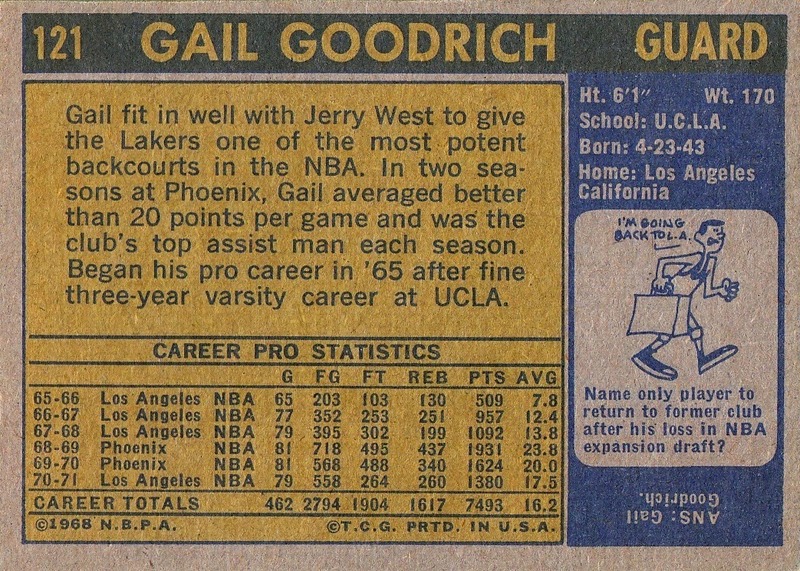 Almost perfect stats and a good write-up of the person on the card. Jim Roper passed away in June of 2000, at age 83. I have not done a One Hit Wonder in a while, but with something I received in the mail yesterday, it seemed as good a time as any. What I got in the mail is something totally new for my collection- which, after almost 30 years and over 100,000 different cards, is something of a rarity these days! Topps put up some original Color Negatives on ebay via their Topps Vault. Each started at $9.95 and there were several pages worth of them, all from the early 1970s. I knew I could not afford to go after them all, so I picked one that I wanted and made sure I would win. As it turns out, I was the only bidder...and now I'm kind of wishing I had placed a few more bids on others. I though they would go a lot higher. I chose the one I did because it was the only one posted for a One Hit Wonder, and even better- it's a photo that was Not used on a card! 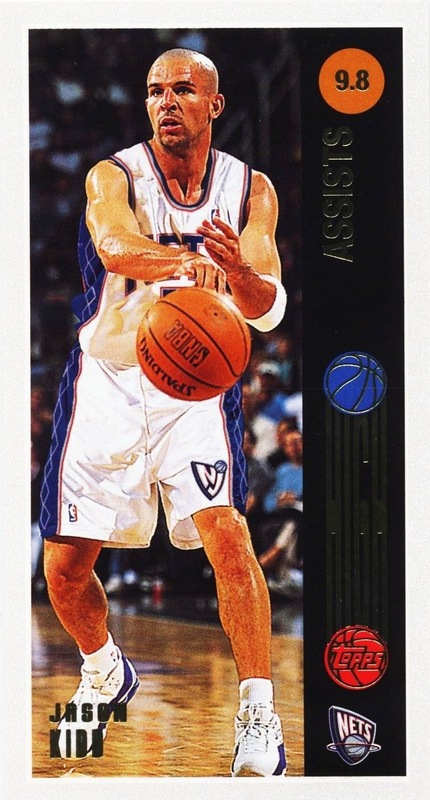 To make it even more important to me, it is the first player I ever realized and researched that was a One Hit Wonder, back in the 1990s sometime. The issued card was one of my earliest vintage card additions to my collection. But first, here is my somewhat poor photo of the Topps Negative. It's rather small, and it's also rather dark- the white backing it floats over is standard card sized. 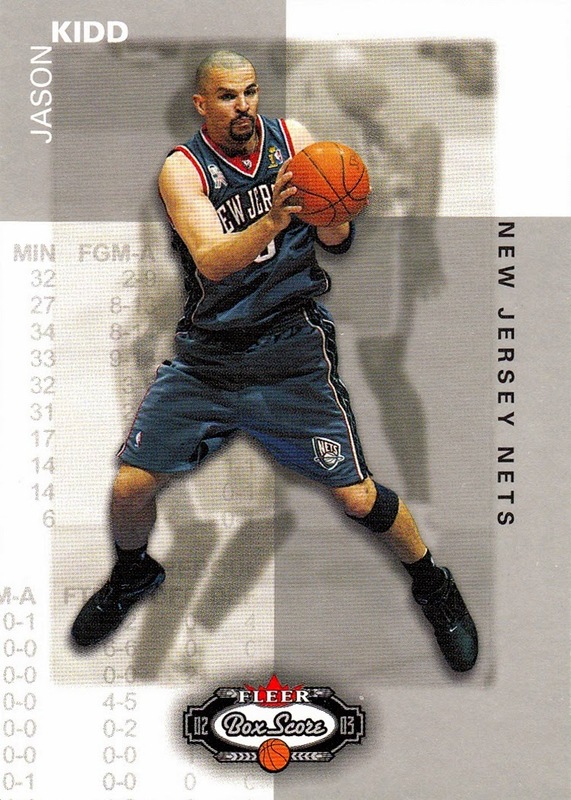 It's in one of the sealed cases Topps debuted back in 2001-02 in Pristene. (I hate those cases, and usually remove the cards from them for my own collection, but I will keep this in there) My scanner has no depth perception so a photo, however poor it may be, will have to do. 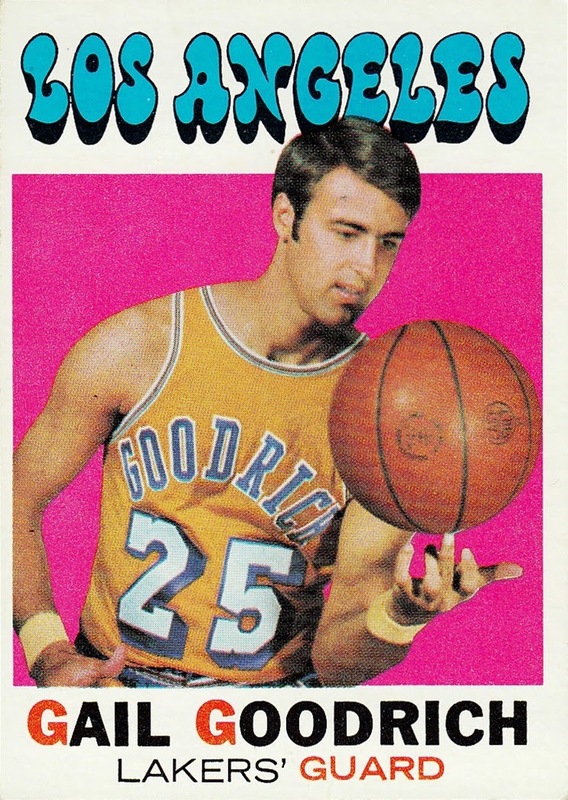 Here is his one and only issued card, from 1972-73 Topps. 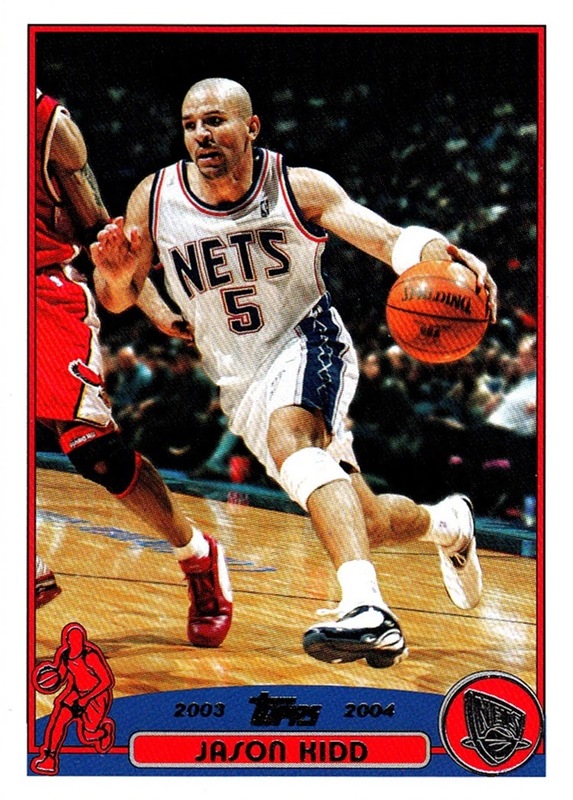 Note that like most cards back then, he is wearing his jersey backwards in the photo. I don't remember the exact details, but I believe I read that Topps did that because they thought it would confuse kids to see a team name that was not the player's name on the jersey, or some such stupidity like that. 1972-73 Topps is actually the least represented Topps set in my collection until 2006-07, when I took a break from collecting the NBA. I only have 76 of them, or 28.8% according to the Database. 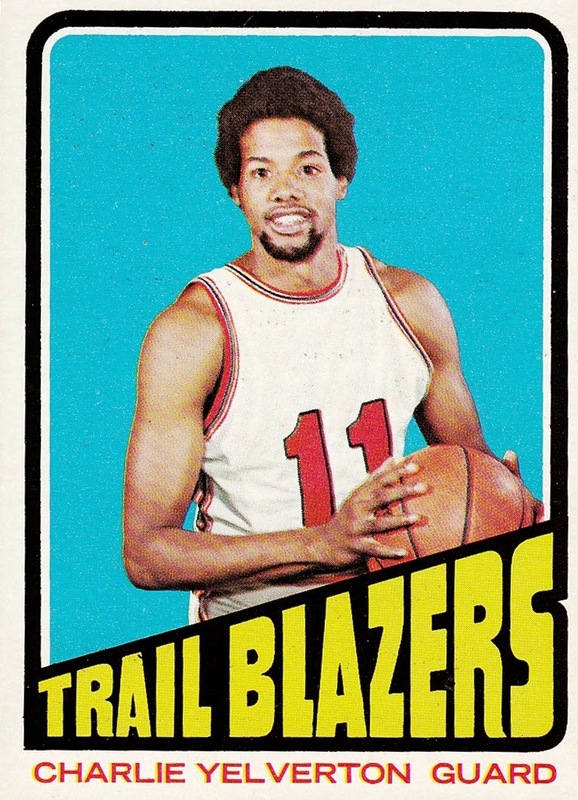 Yelverton played only one season in the NBA, after being selected in the second round of the 1971 NBA draft. But that was far from the end of his career. 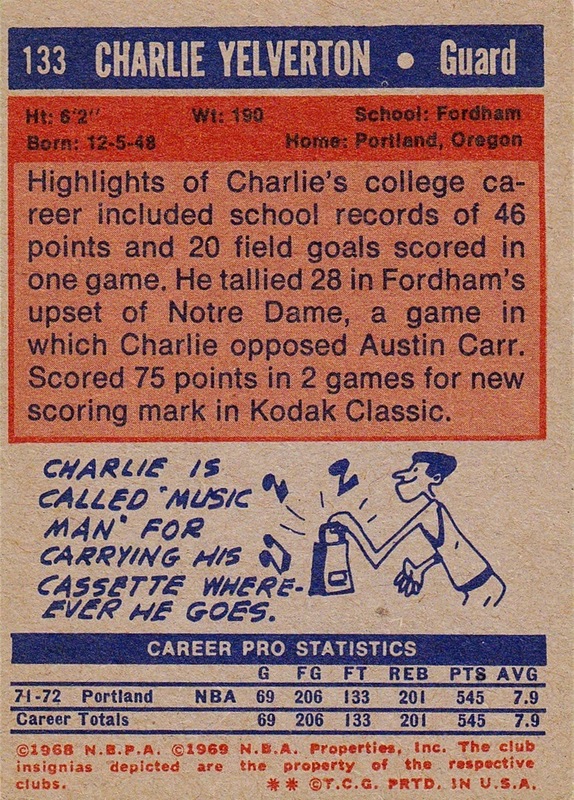 After he was cut by the Blazers, he traveled to Europe, where he played until 1987! 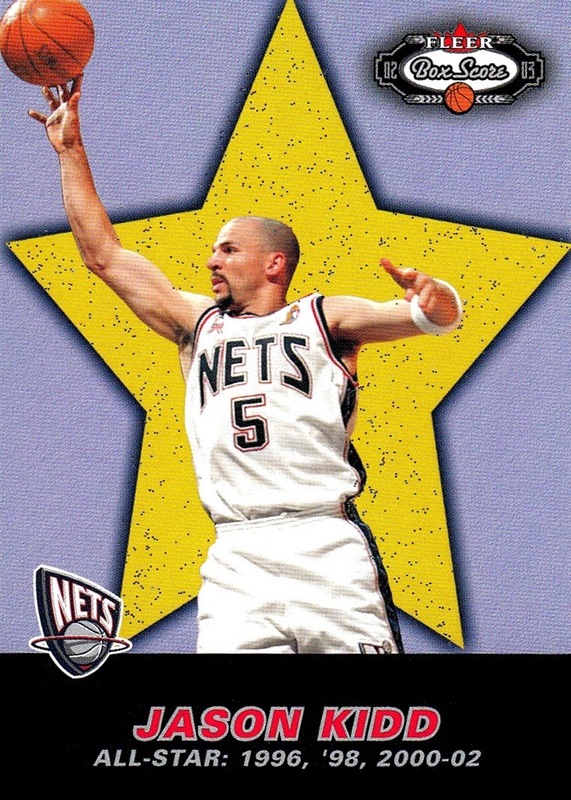 He won a Euroleague and Italian League championship during his time there, and was nominated as one of the 50 Greatest Euroleage players although apparently did not make the cut. 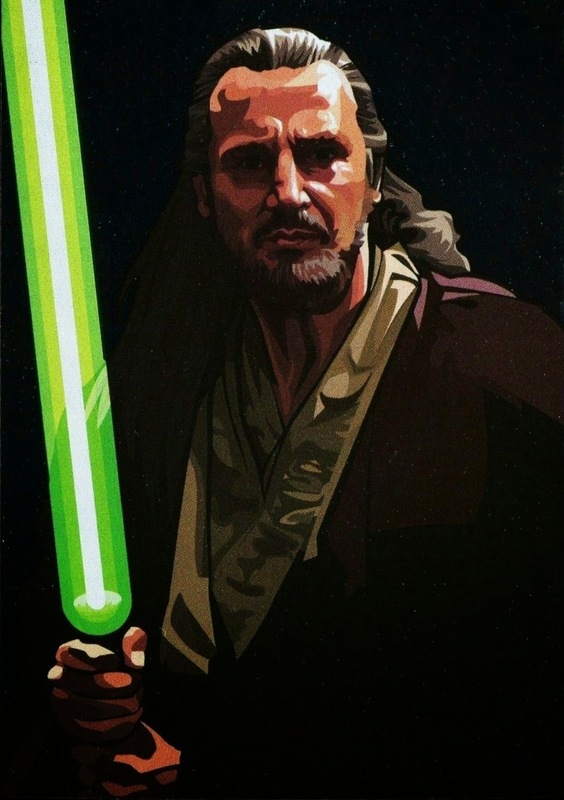 I have long wished that the Euroleage got cards.